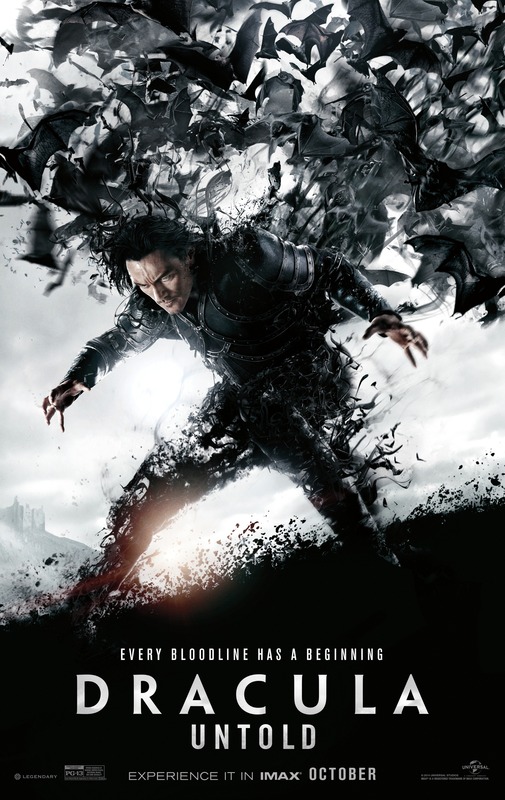 Luke Evans is the latest actor to portray the iconic role of Dracula in Dracula Untold, a film that serves as something of an origin story for the famous vampire. An opening narration establishes the context of the story which has the prince, Vlad the Impaler renowned in his homeland as being something of a hero. When the Turkish threaten to take all the young men away Vlad seeks the power to stop them which has him turned into a bloodthirsty vampire. Dracula Untold takes almost no time to establish the setting and characters which is good given the breezy 92 minute run time. The audience is given all the information they need very quickly. Evans’ Vlad/Dracula is seen to be an honourable man who justly rules over his people as well as being a loving husband and father and let’s not forget that he’s very capable in combat. In essence he’s pretty much every fantasy action hero you’ve ever heard of which isn’t necessarily a bad thing. Nothing about this character reinvents any of these tropes but it’s not done badly and Evans does a good job of imbuing the character with enough likeability to sustain the story. Reinventing Dracula as a tragic antihero with redemption issues is an interesting choice as the character has historically been about as evil as it gets. Becoming a vampire is something he chooses to do for the noblest intentions since he wants to protect his family and the people he rules. He’s told the downsides of all this power but a glimmer of hope is given when he is told that if he can resist drinking human blood for 3 days then he’ll revert back to being a human. After this point we get a scene straight out of a superhero movie where he discovers his new powers and gets used to them. Again it plays into the reinvention of this character someone that audiences should want to root for. Some time is spent showing his bloodlust and how he is struggling with it but it never seems to be all that much of a problem. There are only a handful of moments where he can be seen to be tortured which might come with the short running time. To me this should have been the core of the film but more time was spent on the action aspects and how cool his powers are. The central relationship in the film is Dracula and his wife Mirena (Sarah Gadon) but the relationship feels entirely forced with very little chemistry between the two actors. As might be expected she is the catalyst for him surrendering to his curse but it’s a moment that feels a bit flat considering how poorly the relationship had been established prior to that. Gadon has a thankless role with very little to do other than look pretty which is a shame considering how the tragic aspects could have been exemplified through her struggles to accept the apparently monster her husband has become. Dominic Cooper plays the central villain Mehmed in this film and does a tremendous job of making his performance as ridiculous as possible, it’s a stark contrast to Evans’ stoic sincerity. He never really feels like a threat as a villain but Cooper is clearly having a great time playing this over the top role. Ultimately he only exists to participate in the films climatic boss battle so that Dracula can get his vengeance. Charles Dance has a very small role as the vampire that turns Vlad into Dracula. The scene he appears in has a lot of menace and he seems like a powerfully untrustworthy presence but ultimately he doesn’t actually do much and only serves his small plot function. I thought there might be some battle with the vampire as Dracula tries in vain to reclaim his lost humanity but such a moment never came, it feels like a wasted opportunity in that regard as that small appearance is great. It’s actually baffling that the film takes itself so seriously considering how ludicrous much of the subject matter is. I found it hilarious that it was approaching everything completely unironically. Evans really hams up his tortured scenes to bizarre levels and some of the dialogue is so corny yet delivered with complete sincerity that it needs to be seen to be believed. As with any fantasy movie there is an abundance of action scenes; in this case they are generally executed quite well with Dracula’s powers fully on display and used in fairly inventive ways. It must be a rule that every period fantasy movie since Lord of the Rings has to have at least one battle involving a large army even when it’s not necessary. I feel that this movie might have been better if the battles had been more small scale and showcasing Dracula’s trademark brutality on a much smaller scale. Despite all of the negative aspects I actually really enjoyed this film for the most part. The running time isn’t too long, the casting of Dracula is good enough and there are some genuinely cool action scenes in there. It takes itself a little too seriously but could have been better if the tone was more tongue in cheek. As far as I’ve read this is the first film in a Marvel style shared universe for all of the Universal movie monsters with The Mummy directed by Alex Kurtzman due for release in 2016.